Fans screaming, loud music, bright lights, Friday night football games are a whole nother experience. This past friday night game, Hamilton vs Tolleson, was the first ever CUSD youth night. Cheer, Pom, Band and Football all invited kids from all ages to come and participate in Friday night lights. Some got to perform some got, some got to watch the night unfold, But for everyone, they got to witness their idols do what they love. Hamilton Varsity Cheer and Pom welcomed kids Kindergarten through eighth grade to come and learn what they do every friday night. The kids got to cheer on the football team and dance their little hearts out. Pom coach, Megan (insert last name) talked about what she believed the little girls appreciated most, (insert quote). Even as cheerleaders, being apart of the clinic helps you realized how much those little girls in the stands trying to do the routine with you idolize you. When asked, all the girls could not wait to get on the field and show off their sweet dance moves, “It was the best night ever! 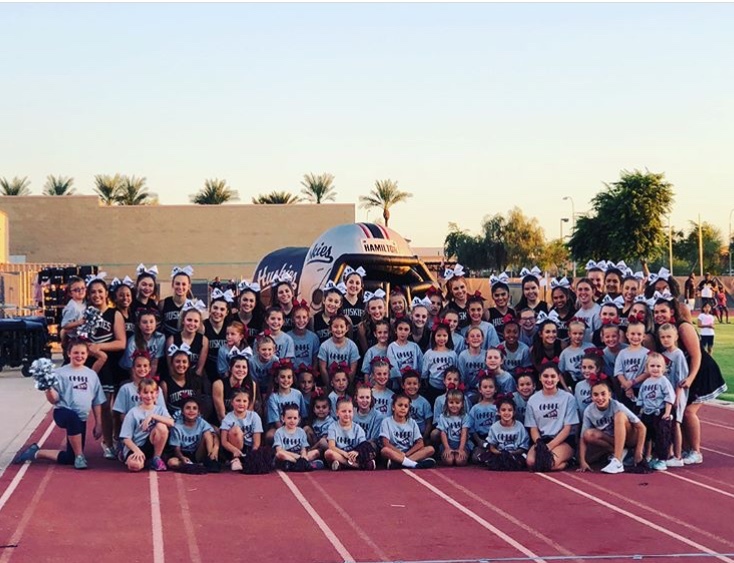 I was nervous walking out but once we started cheers I felt really happy!” stated Halle Foster, first year participation of the little huskies clinic. Football also invited Bogles flag football team to sit on the field and watch them play. They even got to run out of the big Hamilton helmet as the game started. The smiles on these kids faces were irreplaceable. Being able to be apart of a night like this allows Hamilton’s older athletes to sit back and realized how many younger kids look up to them. It makes you want to be the best you can to prove, with determination, you can really do and be anything you want to be.